VISA, in alliance with AKPK (Malaysia’s Credit Counselling and Debt Management Agency), are inviting you to play football. Prize: a trip to the 2014 FIFA World Cup in Brazil. There is no catch to this exciting offer that will also help you develop smart money management skills. The 2014 Financial Football Malaysia online competition ends on April 16 when the top 10 scorers will be called to compete at the grand finals on April 23. The competition is open to all Malaysians, permanent residents and those above 18 years old, who are registered under the Malaysia My Second Home (MM2H) scheme. 1. The game requires players to answer a series of multiple choice questions to advance down field. 2. Players can choose to pass, dribble or shoot by clicking on relevant questions. 3. Correct answers will lead to the successful execution of the move while a wrong answer will result in the player losing possession of the ball. 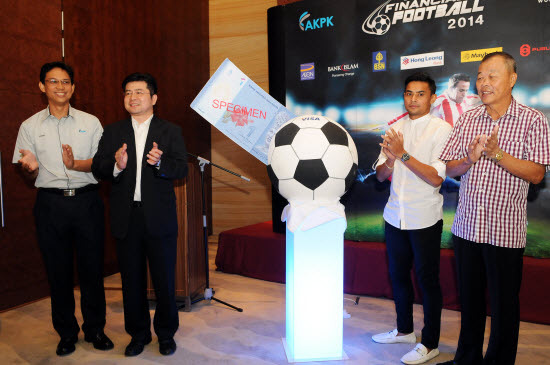 The 2014 Financial Football Malaysia competition is supported by seven of the country’s leading financial institutions, including Bank Islam, BSN, Hong Leong Bank, Maybank, Public Bank, UOB and Aeon Credit Services. Registration is accessible through AKPK and bank partners’ websites as well as my.financialfootball.com. In promoting good governance on monetary issues and financial matters, Visa, together with its bank partners, will distribute brochures featuring simple tips and guidelines.